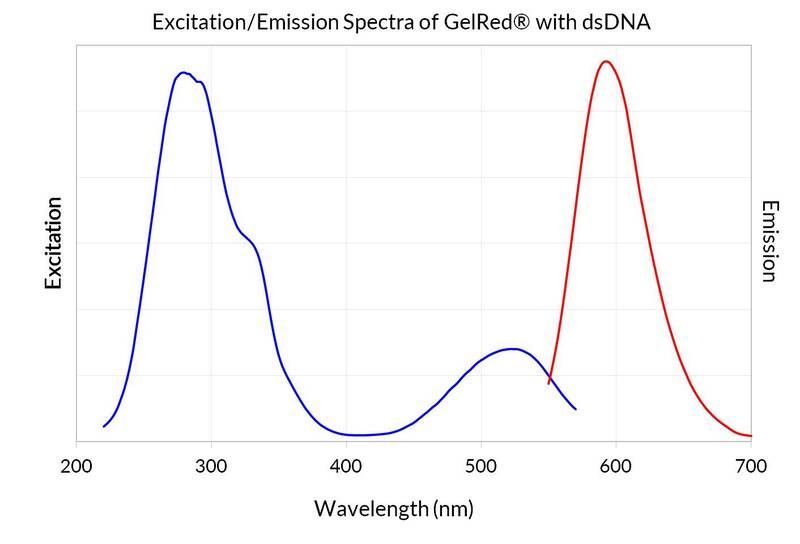 6X DNA loading buffer that includes ultra-sensitive, non-toxic GelRed® dye. This is an improved version of our original GelRed® prestain loading buffer, formulated to minimize DNA migration shift. Why am I seeing smeared or smiling DNA band(s) or discrepant DNA migration? Many customers use GelRed® or GelGreen® precast gels for convenience. However, because GelRed® and GelGreen® are high affinity dyes designed to be larger dyes to improve their safety, they can affect the migration of DNA in precast gels. Some samples, such as restriction digested DNA may migrate abnormally in GelRed® or GelGreen® precast gels. Smearing and smiling in GelRed® or GelGreen® precast gels most often caused by overloading of DNA. If you see band migration shifts or smearing and smiling, try reducing the amount of DNA loaded. The recommended loading amount for ladders and samples of known concentration is 50-200 ng/lane. For samples of unknown concentration, try loading one half or one third of the usual amount of DNA. This usually solves band migration problems. To avoid any interference the dye may have on DNA migration, we recommend using the post-staining protocol. 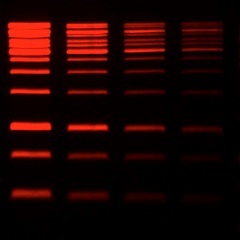 If your application requires loading more than the recommended amount of DNA, use the post-staining protocol. While we recommend post-staining gels for 30 minutes, you may be able see bands in as little as five minutes, depending on how much DNA is present. Post-staining solutions can be reused. See the GelRed® Product Information Sheet or GelGreen® Product Information Sheet for detailed protocols. If you see DNA migration issues or smearing after post-staining with GelRed® or GelGreen®, then the problem is not caused by the nucleic acid dye. Avoid overfilling gel wells to prevent smearing of DNA down the surface of the gel. Pour a lower percentage agarose gel. Higher molecular weight DNA separates better with a lower percentage gel. Change the running buffer. TBE buffer has a higher buffering capacity than TAE buffer. Why do I see weak fluorescence, decreased dye performance over time, or a film of dye remaining on the gel after post-staining? The dye may have precipitated out of solution. Heat the GelRed® or GelGreen® solution to 45-50°C for two minutes and vortex to dissolve. Store dye at room temperature to avoid precipitation. If you are seeing high background staining of the gel, the agarose that you are using may be of low quality. Contaminants in the agarose may bind to the dye, resulting in increased background. GelRed® is a sensitive, stable and environmentally safe fluorescent nucleic acid dye designed to replace the highly toxic ethidium bromide (EtBr). GelRed® Prestain Plus 6X DNA Loading Dye contains density agents, tracking dyes, and GelRed® dye. The 6X prestain loading dye is added to samples in place of gel loading buffer, and eliminates the need to add fluorescent DNA dye to the agarose gel during casting or after electrophoresis. The loading dye contains two blue electrophoresis tracking dyes that run at approximately 1.5 kb and 200 bp in a 1% agarose gel. This product is an improved version of our original 6X GelRed® Prestain Loading Buffer (catalog number 41009) with brighter signal and more consistent DNA migration. When DNA is bound to GelRed® before electrophoresis, the ratio of dye to DNA can cause variable shifts in DNA migration, making it difficult to compare DNA fragment sizes between samples. 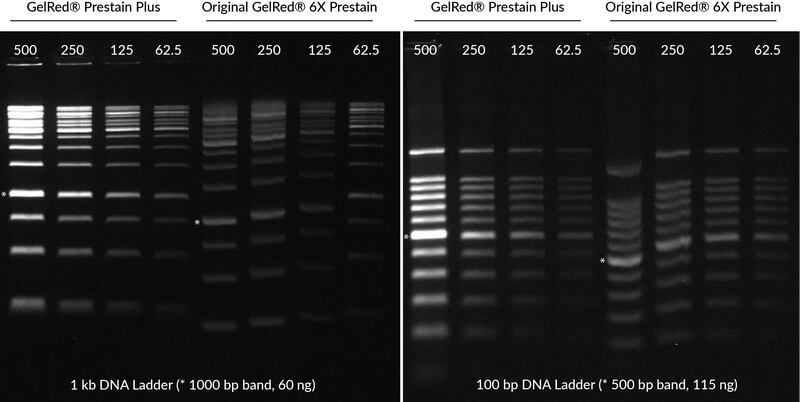 GelRed® Prestain Plus 6X DNA Loading Dye is formulated to minimize this DNA migration shift, for greater consistency. GelRed® prestaining is simple and can avoid migration issues seen with GelRed® precast gels. GelRed® and EtBr have virtually the same spectra, so you can directly replace EtBr with GelRed® without changing your existing imaging system. 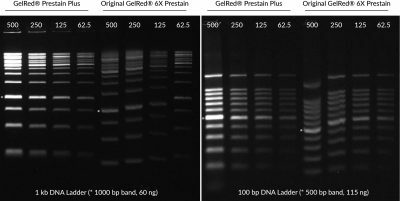 In addition, GelRed® is far more sensitive than EtBr, which cannot be used in DNA loading buffer to prestain DNA. 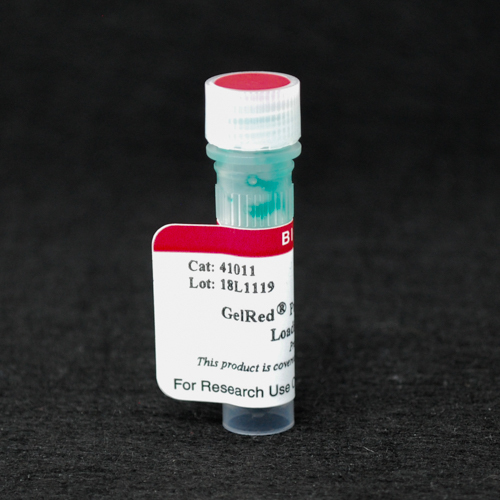 GelRed® is compatible with downstream applications such as sequencing and cloning. It is efficiently removed from DNA by gel extraction kits or by phenol/chloroform extraction and ethanol precipitation. GelRed® was subjected to a series of tests at Biotium and by three independent testing services to assess the dye’s safety for routine handling and disposal. Test results confirm that the dye is impenetrable to both latex gloves and cell membranes. The dye is noncytotoxic, nonmutagenic, and classified as non-hazardous for disposal under CCR Title 22 Hazardous Waste Characterization. See the GelRed® and GelGreen® Safety Report. Download a list of selected References for GelRed® and GelGreen®. The 100 bp DNA Ladder is suitable for sizing linear double-stranded DNA fragments from 100 bp to 1000 bp. The 500 bp band contains more DNA to provide internal orientation. 6X DNA Loading Buffer (Blue) contains density agents for loading DNA samples on gels, with two blue electrophoresis tracking dyes. High performance agarose for nucleic acid electrophoresis (analytical or preparative) and blotting. Validated for use with Biotium’s GelRed®, GelGreen®, and DNAzure® gel stains. 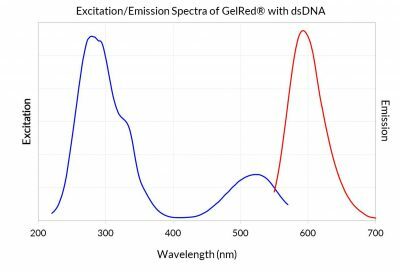 Biotium's DNA Gel Extraction Kit is a silica-gel spin column based DNA extraction kit designed to purify 40 bp-40 kb DNA fragments from agarose gels in TAE or TBE buffer. Each column has a maximum binding capacity of 10 ug DNA. GelRed® Agarose LE is pre-coated with GelRed® Nucleic Acid Gel Stain for simple preparation of precast gels. With no need to handle concentrated fluorescent dye while preparing your gel, GelRed® Agarose offers greater convenience and safety.